Sprained ankles are the most frequent type of musculoskeletal injury seen by primary-care providers. Ankle sprains are common sports injuries but also happen during everyday activities. An unnatural twisting motion of the ankle joint can happen when the foot is planted awkwardly, when the ground is uneven, or when an unusual amount of force is applied to the joint. The ankle joint is made up of three bones. The tibia: the major bone of the lower leg. It bears most of the body's weight. Its bottom portion forms the medial malleolus, the inside bump of the ankle. The fibula: the smaller of the two bones in the lower leg. Its lower end forms the lateral malleolus, the outer bump of the ankle. The talus: the top bone of the foot. Several muscles control motion at the ankle. Each has a tendon connecting it to one or more of the bones of the foot.Tendons can be stretched or torn when the joint is subjected to greater than normal stress. Chronic inflammation of a stretched or torn tendon is called tendinitis. Tendons also can be pulled off the bone, called an avulsion injury. Ligaments provide connection between bones. Sprains are injuries to the ligaments. The ankle has many bones that come together to form the joint, so it has many ligaments holding it together. Stress on these ligaments can cause them to stretch or tear. The most commonly injured ligament is the anterior talofibular ligament that connects the front part of the fibula to the talus bone on the front-outer part of the ankle joint. Ankle sprain. Picture of inversion injury of ankle. Note it is turned inward. Swelling: Due to increased fluid in the tissue, this is sometimes severe. Usually, an ankle sprain itself does not require a trip to the doctor. The problem is how to tell a sprain from a more serious injury such as a fracture (break). If any of the following occur, contact your doctor. Pain is uncontrolled, despite the used of over-the-counter medications, elevation, and ice. The injured person is unable to walk or cannot walk more than a few steps without severe pain. The ankle fails to improve within five to seven days. The pain need not be gone, but it should be improving. There is severe or uncontrolled pain. The injured ankle cannot be moved. The foot or ankle is misshapen beyond normal swelling. The injured person cannot walk four steps, even with a limp. Severe pain felt when pressing over the medial or lateral malleolus, the bony bumps on each side of the ankle. There is loss of feeling in the foot or toes. There is pain and swelling in the back of the ankle (heel pain), over the Achilles tendon area, or the inability to push the toes down (forward-like pressing a gas pedal). There is pain or swelling into the upper part of the lower leg just below the knee or swelling of the calf muscle. Redness or red streaks spreading out from the injury are observed. You don't know how serious the injury may be or are unsure how to care for it. The doctor will perform a physical exam to see if a fracture or other serious injury has happened that requires immediate care. The examination should check that the nerves or arteries to the foot have not been injured and that the knee or the rest of the leg is not involved. The doctor will handle and move the foot and ankle to determine what bony areas are involved. The Achilles tendon will be checked for signs of rupture. X-rays are often needed to confirm if a fracture is present. In some cases of fracture, a CT scan may be needed. Remember RICE: rest, ice, compression, and elevation. Applying ice to the injury will help decrease pain. Anti-inflammatory pain medications such as ibuprofen (Motrin and Advil) and naproxen (Aleve or Naprosyn) will reduce the pain and combat swelling. Treatment by a doctor will be similar to home care, especially using ice to reduce inflammation. 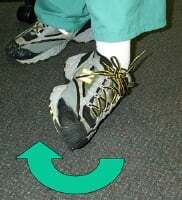 The doctor may elect to apply a brace or cast to reduce motion of the ankle. Crutches are frequently provided so the patient does not bear weight on the injured ankle. The most common medications used for ankle sprains are anti-inflammatory pain medications that both reduce pain and help control inflammation. If the patient cannot tolerate these drugs, acetaminophen (Tylenol) or narcotics are common alternatives. You cannot walk on the injured ankle within a week of the injury. The ankle continues to hurt after two weeks. A follow-up visit one to two weeks after the injury is advisable to help with flexibility and strengthening exercises. In some cases, a physical therapist may help with rehabilitation of the injured ankle. Ankle sprain prevention can be as simple as wearing the right shoes or as complicated as balance training for athletes. Keep the ankles strong and flexible. Consult with the doctor or physical therapist for strengthening exercises. When participating in a sport, consider having a weak ankle taped, as taping offers extra support. If you have repeated sprains, wearing an ankle brace while playing may help. Make sure a playing field (or home environment) is clear of any holes or obstacles to help avoid injury. If you have flat feet or bunions, consult a podiatrist as these conditions could lead to balance problems or instability of the ankle. Most ankle sprains heal without complications or difficulty. Surgery is seldom needed for torn ligaments. Ligament tears are often noticed when sprains fail to get better. If the diagnosis of a tendon tear that needs surgery is not made right away, the outcome of the surgery is the same as if the doctor did the operation immediately. Recovery time depends upon the severity of the ankle sprain and possible accompanying injuries. Exercises should be started to maintain flexibility and strength when the swelling has resolved and the patient can walk without pain. 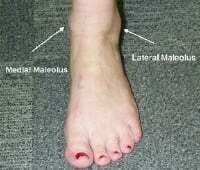 Picture of medial and lateral malleoli, the "bumps" on either side of the ankle. The medial malleolus is formed by the tibia, while the fibula forms the lateral malleolus. A sprained ankle is one of the most common orthopedic injuries. Every day, about 25,000 people in the U.S. suffer an ankle sprain. Ankle sprains occur in both athletes and those with sedentary lifestyles, and they can occur during sports or when walking to carry out daily activities. A sprain is actually an injury to the ligaments of the ankle joint, which are elastic, band-like structures that hold the bones of the ankle joint together and prevent excess turning and twisting of the joint. In normal movement, the ligaments can stretch slightly and then retract back to their normal shape and size. A sprain results when the ligaments of the ankle have been stretched beyond their limits. In severe sprains, the ligaments may be partially or completely torn. To diagnose a sprained ankle, your doctor may order X-raysor other imaging studies to confirm that a bone has not been broken. United States. National Institute of Arthritis and Musculoskeletal and Skin Diseases. "Sprains and Strains." Apr. 2009. <http://www.niams.nih.gov/Health_Info/Sprains_Strains/default.asp#strain_k>. Wolfe, Michael W., Tim L. Uhl, and Leland C. McCluskey. "Management of Ankle Sprains." Am Fam Physician 63.1 Jan. 1, 2001: 93-105. Young, Craig C. "Ankle Sprain." Medscape.com. June 7, 2011. <http://emedicine.medscape.com/article/1907229-overview#a0156>. Please describe the treatment for your ankle sprain. How was your ankle sprain diagnosed?